Last night was the last class in my current sock class series. Three pairs of socks were born last night. I find that extraordinarily delightful! They should all fit, given the techniques that I use in the classes. But I have to admit that I sort of breath a sigh of relief when the socks actually do fit. You can see the Spanish Lavender Basket Wave socks on the low table in the foreground, where I had flung them when I decided that I really, really, really needed a picture of the class right this very minute because they were all such wonderful, bright students (as all my students are) and the was the last class and I might not teach another series for a couple of months and my hands hurt and I couldn’t knit very well. But mostly I wanted the picture. 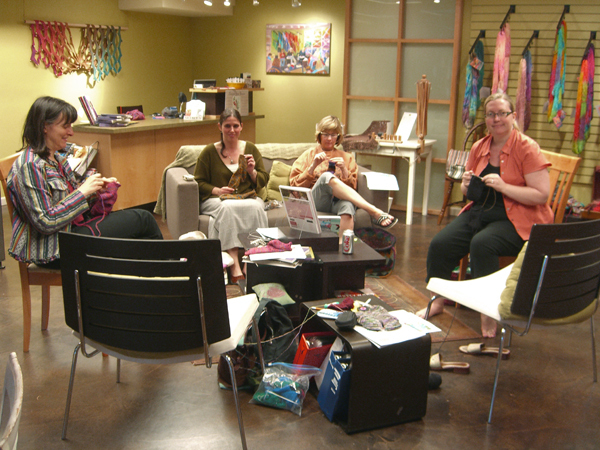 Be sure to click on the pic to see the sock knitters in a bigger version. 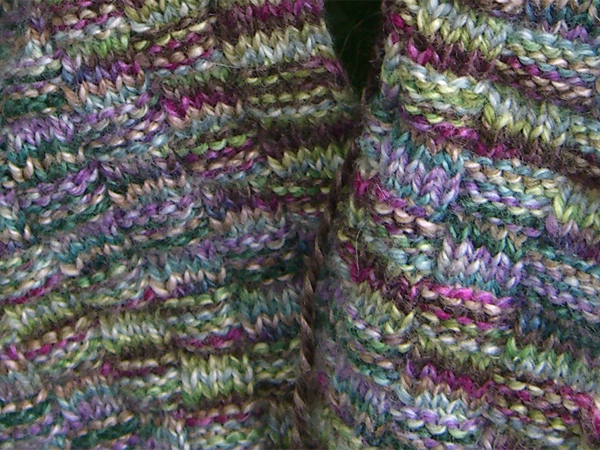 Bobby is a little sample sock that I knit from various worsted-weight left-overs that were hanging about in my stash. 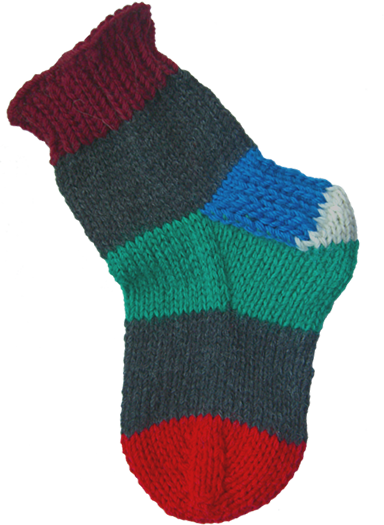 The different colors are meant to show the different parts of a sock and how they all fit together. Then we talk about how now we’re going to knit that green part, and the heel turn isn’t all that scary when you see that it’s just this tiny little white triangle. Bob and I are old friends. When not in service in a class, he lives in the plastic bag you can see on the floor in the first pic, along with various samples and demos that I show my classes. And it all lives, along with calculators and pencils and whatnot, stuffed inside a Pendleton bag that I picked up for about $10 at an outlet mall. LeAnne asks: But fill me in on the new yarn! I don’t remember the name of the new yarn. But it’s hand dyed in smallish batches by a smallish company and it has lovely colorways. The sock yarn has an interesting tight twist that I’m eager to try. I’m thinking that the socks will be sturdy and not much subject to either felting or shrinking, and the stitch definition should be lovely. #1 Son will be home today, back from gallivanting around the North America for the last month. I will be very, very glad to see #1 Son again. I have missed him very much. But we will be having a little discussion about What Responsible Automobile Ownership Really Means And Why It Does Not Involve Your Mother Bailing Out Your Car After It Has Been Towed Or Paying Your Tickets. For far too long I have not been able to post. Not because I’ve been too busy, although that has contributed. No… the latest WordPress upgrade rendered me incapable of actually saving anything I wrote. There are some other changes under the covers that you probably won’t notice. I love WordPress, and certainly the price is right. But free can also be read as virtually unsupported. And sometimes the features that the authors think are really, really cool cause some issues in the general WordPress-using public who are not expecting such sudden changes. WP 2.2 was not supposed to be a major upgrade. sigh I supposed I should be happy that it forced me into a few probably much-needed updates here and there. Thank you so much, gentle reader, for continuing to visit and comment in my supposed absence. I was listening and watching. And now I’m back. The pictures are proof that I did get a little knitting time in. 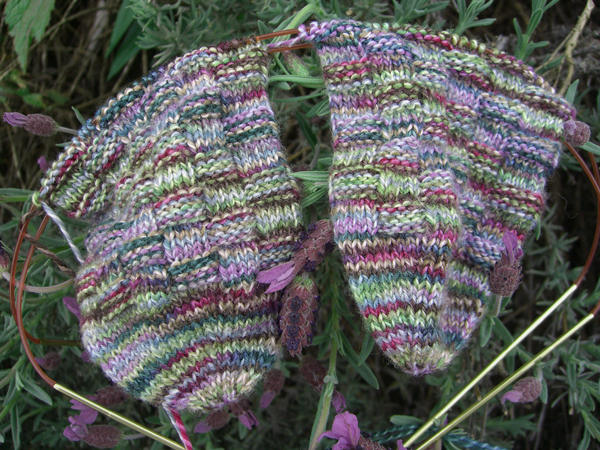 The Spanish Lavender Basket Wave socks are up past the heels and heading up the legs. They are posing amidst my Climbing Iceberg rose. It’s nearly time for the annual Rose Festival and everything is in bloom. I really wanted to photo the socks with my Eyepaint rose. But, alas, the bright red of the rose did not add anything to the lovely Walking On The Wild Tide colors. White, fortunately, goes with everything. Anyway, I worked the heel flap in heel stitch with a garter border. You can sort of see it on the right-hand sock in the picture. I think it fit into the basket theme quite well and looks like it’s lined up nicely with the pattern on the leg. The lower picture is a close-up of the basket weave stitch pattern across the instep. I know it seems sort of un-sockclub-ish to some to use a different pattern. But I’m really happy with the way this stitch works with this yarn. I would not be nearly as happy with the Sock Club pattern, although it is a fine pattern and one I plan to knit with a different yarn. 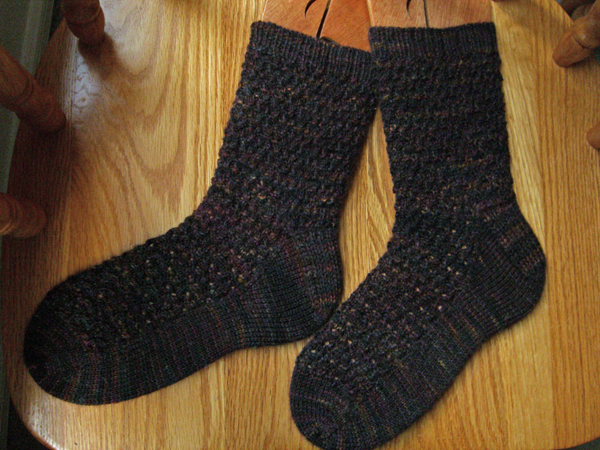 I am still waiting for the perfect yarn, due in at Tangle any day now, to start the socks for my Sockapalooza 4 sock pal. I have no idea what these socks are going to look like. But I know the yarn will tell me what it wants to be. [ed 11:12 am PDT] P.S. I almost forgot to mention that there are now a couple of wonderful Magic Cast On videos available on the web. I’ve linked to them in the right-hand sidebar. One, from the kind people at Renaissance Yarns has a voice-over in English, and the other, courtesy of Calcetines Tejidos is in Spanish. Enjoy! Yesterday my whole department at work volunteered at the Oregon Food Bank, helping to sort and box up some of the 670,000 lbs of food received during the recent Letter Carriers’ Food Drive. It was a fun and productive way to spend an afternoon. 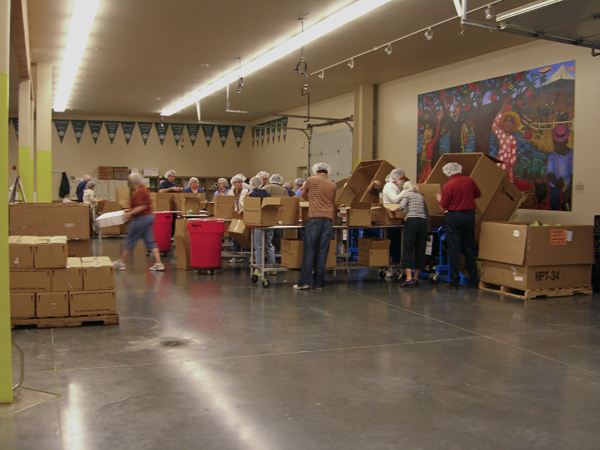 Oregon Food Bank is the “hub” of a network of over 880 food banks in Oregon and Clark County, Washington, that range in size from very large to tiny operations in the basements of churches. Funded almost entirely by donation, the warehouse is a huge, state-of-the-art facility that was designed and built specifically as a food bank. And, let me tell you, it runs like clockwork. Our group stood at long tables unpacking food from huge boxes and repacking it into smaller boxes that could be sent out to other agencies around the state. Cans and boxes that were opened or damaged or didn’t include ingredients labels were put in a big box to be picked up by a farmer who feeds it to his pigs. Very little was deemed unsuitable even for the pigs and so thrown out. Very little is wasted. The big boxes were on these really cool tipper frames. Instead of leaning over the box trying to get to the bottom of it, you just tipped it up on the frame. You can see a couple of the big boxes tipped up over at the right. Made me wish I’d had one of those tipper things when unpacking after my last move. I might have actually finished my unpacking in something less than the three years it took. My station was all the way in the back because I had volunteered to make boxes. Box Assembly as we pros 🙄 like to call it, is simply folding in the bottom flaps and slapping tape on them to keep the bottom of the box closed. Nothing to it. Except I was handed a defective tape dispenser (I am not making this up). I wrestled with it for a few boxes, then someone pointed out that there were a bunch more tape dispensers over on a shelf. A new dispenser made all the difference, and I was off taping boxes together like a mad woman. I think I taped about a bazillion boxes. OK… maybe it was closer to 150. But it was still a lot. At the end of the day, the volunteer coordinator tells you how much you have helped. All together, we packed 11,667 pounds of food. That’s enough for 8,975 meals. Or, if you look at it another way, that’s enough to feed a family of 4 three meals a day for two years. We like to think that we live in an affluent society. But last year 20% of Oregonians required hunger relief aid. They are often working families with parents forced to choose between paying rent and eating. They are children and the elderly and the disabled. They are your neighbors and mine. OFB can collect and distribute 6 lbs of food for every $1 in donations. Less than 5% of their revenue goes towards administrative costs. That’s outstanding for any charity. If you are in the Portland area, I encourage you to spend an afternoon volunteering at Oregon Food Bank. There is always work to do there. If you are not in this area, I encourage you to find opportunities in your area to volunteer to fight hunger. We had a blast yesterday. I can’t believe how much fun box assembly can be. I got home last night with hands too tired for knitting, so no further progress on the Spanish Lavender Basket Wave socks. But it was a really, really good tired. Kristie suggested calling these the Basket Of Spanish Lavendar socks. And Kathy voted for Basket Wave socks. 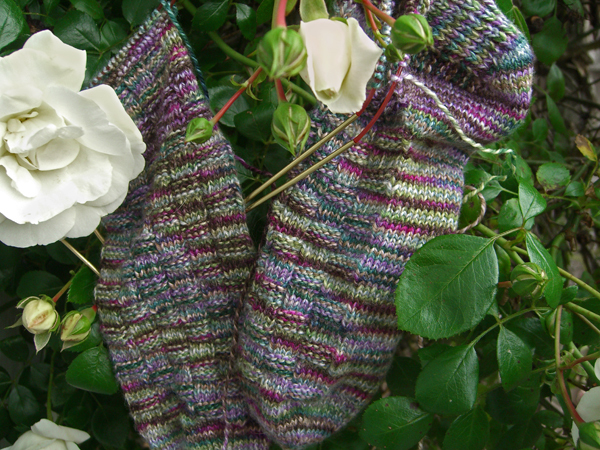 I like both of those suggestions and can’t choose between them, so I am combining and calling these socks the Spanish Lavender Basket Wave socks. Ah… I feel so much better when the socks on my needles gain a name. Silly, I know, but that’s when I know I’m going to actually finish them, and it just feels like all is right with the world. I thought you might be interested in seeing how the sole side is vaguely striping in a sort of diagonal-ish way. STR, it seems, is never truly random. But I like the way the colors are combining. 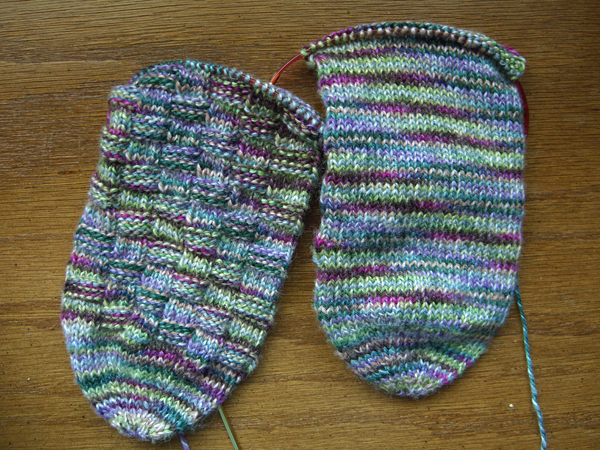 So — basketweave on left, stockinette on right. I’m about 1/2 of a pattern repeat away from starting the gusset increases. It will be interesting to see how this yarn reacts over the gussets. I haven’t decided if I should knit the heel turns and flaps from the opposite end of the yarn to not disturb the non-pattern. Or what stitch I should use on the heel. Eye Of Partridge, maybe. And speaking of sock progress . . . The other day I was minding my own business, knitting away at Tangle, when I heard Alice call from the back room: Judy, do you want to see our new sock yarn? That’s kind of a silly question, isn’t it? I will reveal nothing until the yarn actually gets here. But I will say that it’s scrumptious, out of the ordinary, and there’s a colorway that I think will be just perfect for my Sockapalooooza pal. And there may also be a really awesome lime green that might find a home in my collection. Just maybe. When the yarn is in hand, then I’ll decide what to do with it. We shall see. I notice that there are a lot of Sockapaloooozers who have already started their socks. Mine will probably be the next pair on my needles. But I have until August 2 to mail them. Tons of time. (famous last words) So the sidebar is now counting down to 08/02/07 instead of Christmas. We’ll see if that keeps me honest. A survey apparently finds Portland the city with the friendliest drivers. Are they driving on the same roads I do? P.S. I hope all of you moms out there had a wonderful Mother’s Day. I had breakfast with my former MIL and it was fun. #1 Son is in Canada, but he remembered to call, and that was wonderful, too. Can’t wait to have him home again.